The Canadian Government is feverishly working, behind the scenes, and, according to the polls, against the wishes of the Canadian people, to close a trade deal with China. Canadians don't want any truck or trade, free or bilateral, with the communists in Beijing. It will be anything but free. The new Chinese Ambassador to Canada, Lu Shaye, comes straight from the Communist Party's Central Committee. He wants a free trade deal with Canada but only on China's terms. Shaye demands that its state owned enterprises (SOEs) be granted rights to acquire any Canadian resources or corporate entities that they desire. Any interference will be deemed impermissible "restraint of trade." That's disingenuous at best. Beijing also regards national-security reviews as "protectionism." We should be very cautious of the duplicitous regime in China. We're still seething over the fact that it wasn't until four years ago that Canada stopped sending "aid" to Beijing. Not until 2013 did it dawn on the Foreign Affairs department that China had become the world's second-largest economy. Over its final twelve years, Canada's aid package to China has cost Canadian taxpayers nearly a billion dollars. A great amount of that money was apparently spent on democratization and reform. All that money was clearly wasted, as President Xi's reversal of Chinese reforms has made so brutally clear. We'd like our money back. The Hytera/Norsat Communications deal has turned sour, as expected. Hytera was suddenly expelled from their mobile-technology trade association for its involvement in disputed bidding on a police contract. It's not surprising that there were also allegations of business "malfeasance." Motorola is still in litigation with Hytera, accusing the Chinese firm of "large-scale theft" of its proprietary technology. Make no mistake, Hytera (or a team of the estimated 100,000 Chinese state-sponsored cyber-warriors) hacked into Motorola's servers and stole their technology. Let's not let cultural relativism get in the way of trade policy. We do not share the same values as China. Not even remotely. Neo-Confucianism is not Judeo-Christianity. Why are we doing business with these people and why are we not pursuing trade with our traditional allies and friends from Europe and particularly the United States where we share the same culture and traditions, including the English language, common law, and intellectual property rights? In the end, a "free trade" deal with China will end in tears for Canadians and we don't need them to be prosperous. China refuses to abide by the rules, regulations and principals of the World Trade Organization (WTO). They are illegally subsidizing exports. They have absolutely no worker health and safety standards and effectively employ slave labour. They have routinely manipulated their currency and refuse to abide by even rudimentary environmental standards. No surprise that they want us to sell them Canada's pristine water. China's waterways are a toxic environmental catastrophe of biblical proportions. More worrisome still is the fact that they have no respect for intellectual property and are stealing and counterfeiting everything and anything. I find it disconcerting, no alarming, that Vancouver is now 43% Asian and only 36% Euro-Canadian and according to StatsCan, "Canadians" will be halved again by 2030. This great Canadian City has become a suburb of Shanghai, without the consent of the Canadian people. John Mersheimer at the University of Chicago, argues that the West in general, but specifically the United States, is in a "Thucydides Trap" with China that will turn "hot" inside thirty years. It will be interesting when push comes to shove over China's outrageous territorial claims in the South and East China Seas and Taiwan. Where will Canada stand at that time? Worse still is the massive amount of money being laundered through Canadian realestate. So much so, that our children and grandchildren will never own homes, at least not in Canada's formerly great cities. Canadians will have to live with "intensification"-"vertically integrated," with three generations forced to live under one roof. Chinese "Trans-Nationals" get the real estate, with corrupt money, pay little or no taxes, don't contribute, and force Canadians, who built the physical and social infrastructure out of their own market. I like to call this "assured lower standard of living" (ALSL). The same people who coach little league soccer and hockey and volunteer at the local hospital continue to pay the taxes that maintains that magnificent infrastructure. Perhaps we should be thankful. We get "diversity" in return. Nice trade. Enough is enough. Don't let them bully us and don't appease them. The Australians are finally coming to their senses and finally standing up to Beijing but it's almost too late for them. China has already purchased significant swaths of Australian property including ports, farms, homes, and even critical electrical infrastructure. 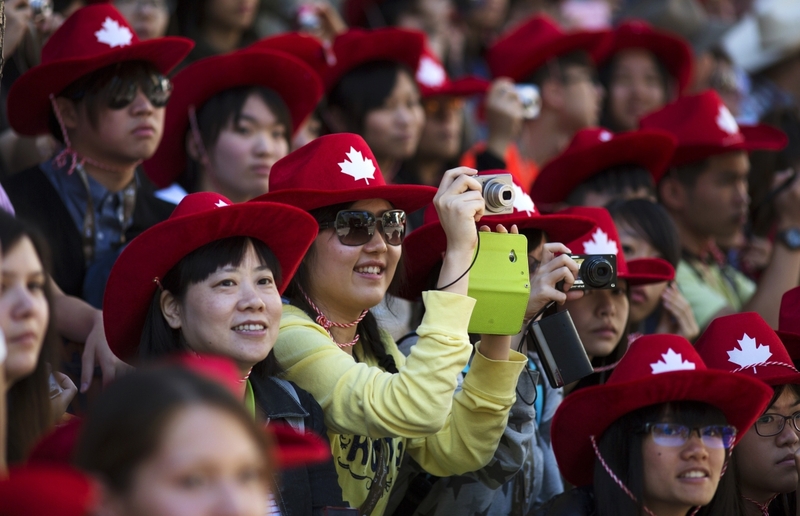 China has now set their sights on Canada. Grouse Mountain was sold to a Chinese SOE recently, in addition to Norsat Communications mentioned above, and they have a large equity stake in Teck Resources. Quan Chong, a Deputy to the National People's Congress, sits on the Board of Directors. They are just getting started. The West's favoured "win-win" approach to trade has failed miserably and will continue to fail. While we fret about gender pronouns virtually all of China's top thinkers see the future in relatively stark terms: China wins, barbarians lose. "Win-win" means China wins twice. This is so well understood in China that it is a National joke. The first win comes in terms of the deal, which they humbly argue should favour China because they are an "underdeveloped" country. The second "win" comes when they arrogantly and deceitfully cheat on the terms. The big losers in these "negotiations" are Western workers, Western (and Canadian) businesses and Western prosperity. Canada needs to understand that President Xi Jinping not only wants to redress the humiliations of the 19th and 20th centuries but the Middle Kingdom believes that it is their manifest destiny to usher in a new Sinocentric order. They are determined to be the undisputed hegemon of the 21st century and are ruthlessly pursuing that goal. China has been in a decades-long covert cyberwar against the West and Canada and have stolen billions and billions of dollars in intellectual property, particularly, so called "dualuse" technology. They are also feverishly uncovering cyber-vulnerabilities in Canada, the United States and what is left of the West in general that could be exploited in the possibility, some argue inevitability, of open conflict. This also explains their almost pathological drive to bolster "soft-power" with radio networks and Confucian Institutes inside Canada and the West in general. It's also why the PRC is engaged in an "undeclared" trade war with us. The economic war with China is everything. And we have to be maniacally focused on that. If we continue to lose it, we're five years away, I think, ten years at the most, of hitting an inflection point from which we'll never be able to recover." (Interview in The American Prospect, August 2017). Stop treating China's leaders as if they were our democratic friends from Europe, the United States or Japan, when in fact this is a murderous regime every bit as brutal as Stalin's Russia. Their Human Rights record is appalling. There is evidence that they are harvesting human organs on an industrial scale. They are racist. They have treated their own minorities including Tibet, horrifically. Let's get our heads out of the sand. Rather than trading with these SOEs, we should encourage swift justice for Chinese spies caught in Canada; strong sanctions against Chinese cyber-warfare, and zero tolerance for currency manipulation. Finally, Mr. Trudeau should assure Canadians workers that, "We are not going to ship your job to Guangzhou or Shanghai for products made more cheaply because of slave labor, illegal export subsidies, blatant piracy, and an undervalued yuan." Sorry, too late. China would never allow a Western or Canadian company to buy any Chinese firm in a "strategic industry." Those industries include aircraft, autos, energy, finance, technology, natural resources, and just about anything more sophisticated than fast food. Because of the strategic threat from foreign governments gaining control of Canadian private and public companies and industries, we should pass legislation preventing domestic private firms from entertaining offers from state-owned enterprises, whether they are Chinese, Russian, or otherwise. Period. The entry fee for any Canadian company wishing to scale China's "Great Walls" of protectionism and sell into local markets is not just to surrender its technology to Chinese partners. Canadian companies (read Western companies in general) must also move research and development facilities to China, thereby exporting the "seed" of future Canadian job creation to a hostile competitor. Canadians also find it alarming that China's growth has funded one of the most rapid and comprehensive military buildups the world has ever witnessed. Every "Walmart dollar" Canadians now spend on artificially cheap Chinese imports represents both a down payment on our own unemployment and additional financing for a rapidly arming China that is increasing aiming those weapons at us. Make no mistake, China is developing advanced weapons systems — many of which have been stolen from us or our allies by Chinese spies. Finally, it is immoral to trade with China. China is one of the most egregious human rights violators in the world. China's Communist Party imposes strict limits on the expressive, religious, and journalistic rights of its people. Strict population control laws force women who become pregnant after having two children to undergo forced state abortions. This has led to the world's most appalling gendercide in recorded history. Dissidents have reported being used for medical experiments, cut open, and forced to sell their organs on the black market for the government's profit. Christians face arrest, torture, and beatings if they do not belong to the "Three-Self Patriotic Church," the state-approved Christian institution. There is no moral justification for trade with this communist regime. Please, cease trading and disengage with governments that beat, torture, and kill its citizens for dissent. Leave them build their belt and road and partner with Pakistan. We have a Burkean responsibility to stand up to China or generations of Canadians yet unborn will never forgive us. We're already in a trade deficit of roughly $44 billion dollars annually to Beijing. Warren Buffet refers to this as "conquest by purchase" and warns that foreigners will eventually own so much of the "West" (including Canada) that Canadians will wind up working longer hours just to eat and service the debt. Never mind thriving in China's century, we should be focused on surviving. Canadians want no truck or trade with the totalitarians on steroids in Beijing. Chinese President Xi Jinping makes U.S. President Donald Trump look like Ghandi. No "free" trade deal with China. We don't need them to prosper.